Participating in creative projects has been shown to help slow cognitive decline, increase self esteem and promote socialization in seniors. That’s why I intentionally incorporate crafting into programming at Armbrook Village. These activities, such as scrapbooking and hanging homemade bird feeders or holiday ornaments, are meant to increase fine motor coordination, mitigate the effects of osteoarthritis, increase grip and finger strength and promote sequencing and decision making. There is even research that shows the aging brain as more amenable to creative thinking than a younger brain! I mainly work with seniors who have MCI or mild cognitive impairment, and they are some of the most creative people I know. Because of my occupational therapy background, I see much more meaningful results than the colorful centerpieces and jewelry that Armbrook residents produce. Our programs are aimed at promoting sharing, eye contact, patience and appropriate social behavior. 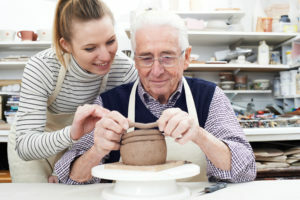 These skills become increasingly difficult for a person with cognitive impairment, but in a nurturing, failure-free environment, they become extremely possible. When one follows directions, like gluing the back of an object in order to adhere it to a project, the synapses of the brain are firing. We know that each time an electrical impulse travels through the nervous system, it helps to preserve that brain pathway. Deciding what color to paint a birdhouse or Christmas ornament encourages self expression and individuality. Even folks who claim they “can’t draw a straight line” still know what they like or don’t like. These choices promote independence and confidence. Additionally, when you are participating in an activity that you enjoy, such as coloring, painting or crocheting, your stress and anxiety levels decrease. Anyone who has taken part in creative projects knows that it is often accompanied by some sort of tension. However, this is where the magic happens. Using different parts of your brain stimulates concentration, problem solving and initiative. Although fun is always centric to our activities, participation in a project that is slightly challenging increases frustration tolerance. We are constantly evaluating and grading our programming in order to provide “just the right challenge” for the individual. Therapeutic programming is largely about observation and assessment of the individual at a particular time. As each of us know, we all have good days and bad! Our residents living with memory loss are no different. When our residents finish a task, and they find the end product useful and beautiful, they feel a sense of self worth. There may be several tasks that become more difficult, or even impossible, to accomplish with age and memory loss, but my job is to find where they can shine. That’s why I believe I have the best job in the world! 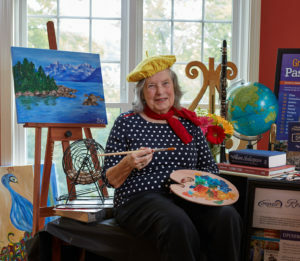 Susan O’Donnell has served as the ConnectedLIFE Program Specialist at Armbrook Village Senior Living Residence since 2016. After caring for her mother with dementia and working in Adult Day Health for six years, Susan discovered that she has a passion for working with seniors who are beginning to show signs of cognitive impairment. Specifically, she enjoys creating therapeutic and meaningful programming opportunities aimed at improving quality of life and slowing the progression of memory loss. Her ability to empathize with families going through this has been invaluable to her work. 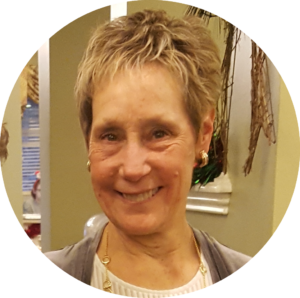 Susan is a Certified Occupational Therapy Assistant-Licensed (COTA/L), as well as a Certified Dementia Practitioner (CDP).